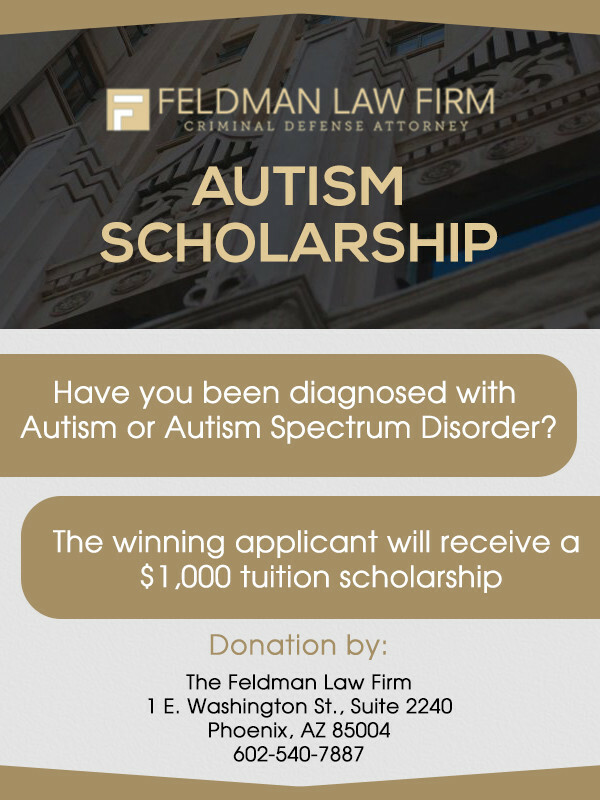 The Feldman Law Firm PLLC, is pleased to announce the offering of another $1,000 educational scholarship for those who have been diagnosed with autism or Autism Spectrum Disorder (ASD). The tuition scholarship will assist in the payment of the cost of attending school, and our goal is to offer encouragement to those with ASD to proceed in the achievement of their educational goals. While ASD symptoms may vary significantly from person to person, those symptoms usually include communication difficulties. These difficulties can have a significant effect on a person’s daily life. ASD presents particular challenges in school, and over 50% of those with autism remain unenrolled in higher education and unemployed during the 2-year period following high school. This is a $1,000 scholarship designed not only to ease the financial burden of educational programs, but also as encouragement and motivation to those living with ASD who would like to further their education. The funds from the scholarship will be used to pay a portion of the tuition at a school (junior college, university, college or vocational school) chosen by the winning entrant. We do not require that applicants be enrolled in school when they apply. The winner has 1 year after the announcement of the his or her name to use the funds. The scholarship is open to any persons diagnosed with ASD/austism (DSM-V) who intend to further their schooling at a college or vocational/trade school. The application deadline is February 21, 2020. The process requires that (a) you complete the online application below, (b) you prepare a short statement of 100 words or less outlining your educational goals and (c) at your option, you may (but are not required to) prepare an essay of 700 words or less explaining how your education has been affected by autism. Any statement or essay must be uploaded with the application. We reserve the right to request proof of your diagnosis as part of the application process. The winner will be selected by Adam Feldman, in his sole discretion. The announcement of the name of the winner will be made on or before July 3, 2020. Any information you provide to us becomes the property of our Firm, but we do not and will not sell that information, nor will we disseminate it to third parties, except as we may deem advisable to publicize the scholarship or our scholarship program.